With metallic gold applique flower trim, this Clear Fillable designer hand-crafted table lamp offers a definitive style boost. Infuse your home with the fresh, designer look of this glass table lamp from our Color + Plus™ lighting collection. The clear glass base can be filled to suit your personal style or home decor - from decorative accessories to themed collectibles, the possibilities are endless! 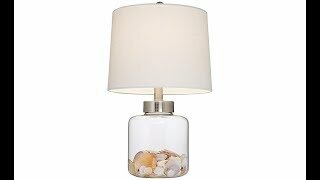 It rests securely on an antique brass finish metal base, and is topped with a chic off-white lamp shade featuring meticulously hand-applied metallic gold applique flower trim. Clear glass fillable base. Antique brass finish base and accents.